The main screen in Microsoft Outlook, as shown in Figure 1, has all the usual parts of a Windows screen but with a few important additions. At the left side of the screen, you see the Navigation Pane. Next to the Navigation Pane, you can find the Information Viewer, the part of the screen that takes up most of the space. 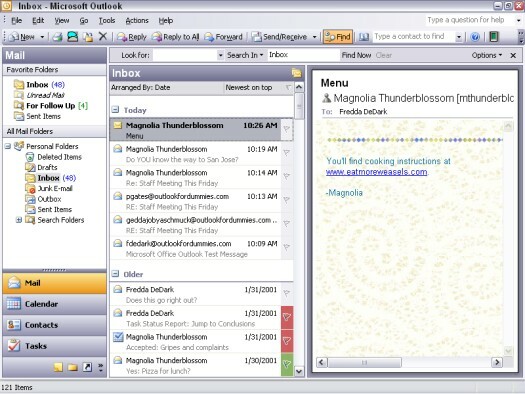 Figure 1: The main screen in Microsoft Outlook. The Navigation Pane (the part of the Outlook screen formerly called the Outlook Bar) is the column on the left side of the Outlook screen. It contains several buttons with names such as Mail, Calendar, Contacts, Tasks, and Notes — the basic Outlook modules. An upper window section. This section of the Navigation Pane displays different kinds of information at different times. Sometimes the top half of the Navigation Pane shows the Folder List, sometimes it shows a list of available views, and sometimes it contains phrases in blue lettering. You can click a phrase to do what that phrase describes, such as “Open a Shared Calendar.” If you want to make the Folder List appear in this top window section, choose Go –> Folder List. A bottom section made up of buttons. Each button in the bottom section connects to one of Outlook’s main modules — mail, calendar, contacts, tasks, and so on. Just click a button and see what happens. Clicking the button changes the stuff on the main screen to fit what that button describes. Click the Calendar button, for example, and a Calendar screen shows up. Click Contacts, and you get a screen for names and addresses. The process is like changing the channels on the TV set. If you switch to a channel that you don’t want, switch to another — no problem. Just above the Mail icon in the Navigation Pane, you can see a gray border separating buttons on the bottom from the top part of the bar. If you drag that gray borderline downward with your mouse, the buttons in the Navigation Pane disappear one by one. You may want to do this drag to get a better view of your Folder List. You can make those buttons reappear by simply dragging the gray border upward again. Most of the action happens in Outlook at the Information Viewer. If the Navigation Pane is like the channel selector on your TV set, the Information Viewer is like the TV screen. When you’re reading email, you look in the Information Viewer to read your messages; if you’re adding or searching for contacts, you see contact names here. You can do all sorts of fancy sorting tricks that each module in Outlook lets you perform in the Information Viewer. Because you can store more information in Outlook than you want to see at any one time, the Information Viewer shows you only a slice of the information available. The Calendar, for example, can store dates as far back as the year 1601 and as far ahead as 4500. (Got any plans on Saturday night 2,500 years from now?) Outlook breaks that time down and shows it to you in manageable slices in the Information Viewer. The smallest Calendar slice that you can look at is one day; the largest slice is a month. The Information Viewer organizes the items that it shows you into units called views. You can use the views that come included with Outlook when you install it, or you can create your own views and save them. You can navigate among the slices of information that Outlook shows you by clicking different parts of the Information Viewer. Some people use the word browsing for the process of moving around the Information Viewer — it’s a little like thumbing through the pages of your pocket datebook. 2. Choose View –> Week. Click a date in the small calendar in the upper-right corner. The large calendar changes to a one-day view. Click the W for Wednesday at the top of one of the small calendars. The large calendar changes to a monthly view. You can change the appearance of the Information Viewer an infinite number of ways to make the work you do in Outlook make sense to you. For example, you may need to see the appointments for a single day or only the items that you assign to a certain category. Views can help you get a quick look at exactly the slice of information that you need.